Accident at Chanatar near Rangpo in Sikkim. Vehcile White Bolero SK 01 P 8692 plunges into the Teesta river. Accident took place around 2 PM. Football jerseys were found is reported. Update: Vehcile had football players who were heading towards Rorathang for match. Boots, Jersies ,Stockings etc were found. However how many were present is still unfound. Update : 5 were in vehicles two rescued, 3 missing. It's reported they are IRBn. Prabin Rai alias Saila and team has started rescue. 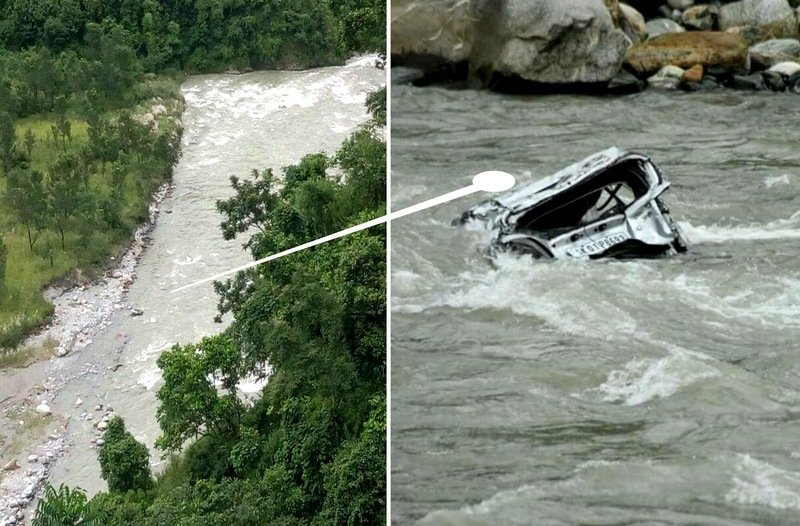 Two passanger has been drifted by raging Rangpo river is reported. Sikkim Police , Civil Defense , Fire Tenders have on rescue operation.